Five polls released today covering four states show former Speaker Newt Gingrich expanding his lead over former Massachusetts Governor Mitt Romney. Two polls from Florida show Gingrich leading Romney 41-24 and 47-17. While Romney has usually led in California, today's poll shows his lead down to three points over Gingrich. 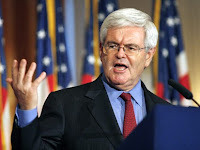 Meanwhile a poll out of Louisiana shows Gingrich leading Romney 31-23, while in Montana Gingrinch leads second place Ron Paul 37-12. Conclusion: The typical Republican voter is a grotesquely cynical person devoid of principles; a hypocritical moral relativist. Paul - Thank you for you comments today on Thought on Tracks. We love Ogden on Politics. Keep up the good work. It sure seems to be, that Nicolas Martin's comment is horribly true.